Carnival Horizon offers many of the hugely popular indoor and outdoor dining, bar, entertainment and activity options available on Carnival Vista including SkyRide, the IMAX Theatre, WaterWorks aqua park, Seuss at Sea program in partnership with Dr. Seuss Enterprises and Alchemy Bar. 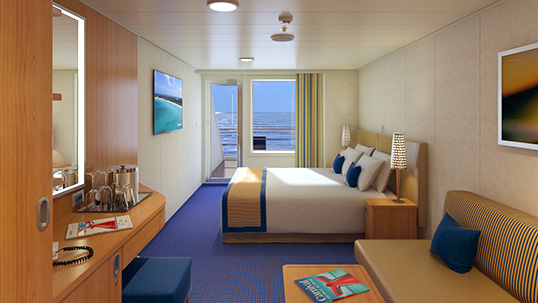 In addition, Carnival Horizon offers a wide range of accommodation categories, including the popular Havana staterooms and extra-roomy Family Harbor cabins. 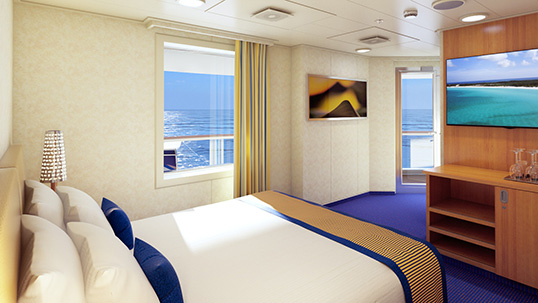 "The name Carnival Horizon not only reflects the ship’s unique connection with the sea with so many spectacular indoor and outdoor spaces but also the boundless array of options that guests of all ages are sure to enjoy,” said Christine Duffy, president of Carnival Cruise Line. 6 night cruise sailing from Miami aboard the Carnival Horizon. 8 night cruise sailing from Miami aboard the Carnival Horizon. Two twin beds (convert to king). Sofa and coffee table. Desk and seat. Full bathroom with shower. 3 closets. Private balcony with patio chairs and table. Exclusive Cloud 9 Spa amenities: Exclusive entry access to the adjacent Cloud 9 Spa facilities, upgraded in-stateroom amenities and Cloud 9 Spa Package exclusive to guests booked in Spa Accommodations. Only 1st and 2nd guests booked in Spa staterooms will receive the access and amenities; 3rd and 4th guests are not entitled to spa access and amenities. Two twin beds (convert to king). Desk and seat. Full bathroom with shower. 3 closets. Private wraparound balcony with patio chairs and table. Exclusive Havana amenities: Exclusive daytime access to Havana Pool area. Reserved deck chairs on the Lanai. Note: All Havana stateroom guests must be 12 or older. Two twin beds (convert to king). Desk and seat. Full bathroom with shower. 2 closets. Private large balcony with patio chairs and table. Exclusive Havana amenities: Exclusive daytime access to Havana Pool area. Reserved deck chairs on the Lanai. Note: All Havana stateroom guests must be 12 or older. Two twin beds (convert to king). Sofa and coffee table. Desk and seat. Full bathroom with shower. 3 closets. Private aft-facing extended balcony with patio chairs and table. Exclusive Havana amenities: Exclusive daytime access to Havana Pool area. Reserved deck chairs on the Lanai. Note: All Havana stateroom guests must be 12 or older. Two twin beds (convert to king), one upper pullman and single sofa bed. Sofa and coffee table. Desk and seat. Full bathroom with shower. 3 closets. Private cove balcony with patio chairs and table. Two twin beds (convert to king). Desk and seat. Full bathroom with shower. 2 closets. Private large balcony with patio chairs and table. Two twin beds (convert to king). Desk and seat. Full bathroom with shower. 3 closets. Private wraparound balcony with patio chairs and table. Two twin beds (convert to king), one upper pullman and single sofa bed. Sofa and coffee table. Desk and seat. Full bathroom with shower. 3 closets. Private cove balcony with patio chairs and table. Exclusive Family Harbor amenities: Access to Family Harbor Lounge featuring breakfast, snacks during the day, concierge service… plus Hasbro board games, family movies, video games and more. Kids eat free in most specialty onboard restaurants and get a free evening of Night Owls babysitting service. Twin bed and single sofa bed. Sofa and coffee table. Desk and seat. Full bathroom with shower. 2 closets. Two twin beds (convert to king). Desk and seat. Full bathroom with shower. 2 closets. Connecting door to adjacent stateroom. Exclusive Havana amenities: Exclusive daytime access to Havana Pool area. Note: All Havana stateroom guests must be 12 or older. Two twin beds (convert to king) and one upper pullman. Desk and seat. Full bathroom with shower. 2 closets. Exclusive Family Harbor amenities: Access to Family Harbor Lounge featuring breakfast, snacks during the day, concierge service... plus Hasbro board games, family movies, video games and more. Kids eat free in most specialty onboard restaurants and get a free evening of Night Owls babysitting service. Two twin beds (convert to king). Desk and seat. Full bathroom with shower. 2 closets. Exclusive Cloud 9 Spa amenities: Exclusive entry access to the adjacent Cloud 9 Spa facilities, upgraded in-stateroom amenities and Cloud 9 Spa Package exclusive to guests booked in Spa Accommodations. Only 1st and 2nd guests booked in Spa staterooms will receive the access and amenities; 3rd and 4th guests are not entitled to spa access and amenities. Two twin beds (convert to king). Desk and seat. Full bathroom with shower. 3 closets. Picture window facing public observation deck. Accessible stateroom: Features entry doorway into the stateroom and bathroom measuring approximately 32", no lip into the bathroom, and roll-in shower with fold-down shower seat. Full turnaround space of approximately 60" x 60" in the stateroom and bathroom. Two twin beds (convert to king). Sofa and coffee table. Desk and seat. Full bathroom with shower. 3 closets. Two porthole windows. Two twin beds (convert to king). Sofa and coffee table. Desk and seat. Full bathroom with shower. 3 closets. Picture window facing public observation deck. Exclusive Cloud 9 Spa amenities: Exclusive entry access to the adjacent Cloud 9 Spa facilities, upgraded in-stateroom amenities and Cloud 9 Spa Package exclusive to guests booked in Spa Accommodations. Accessible stateroom: Features entry doorway into the stateroom and bathroom measuring approximately 32", no lip into the bathroom and roll-in shower with fold-down shower seat. Full turnaround space of approximately 60" x 60" in the stateroom and bathroom. Two twin beds (convert to king). Desk and seat. Full bathroom with shower. 3 closets. Two picture windows. Exclusive Family Harbor amenities: Access to Family Harbor Lounge featuring breakfast, snacks during the day, concierge service… plus Hasbro board games, family movies, video games and more. Kids eat free in most specialty onboard restaurants and get a free evening of Night Owls babysitting service. Two twin beds (convert to king), one upper pullman and single sofa bed. Sofa and coffee table. Desk and seat. Full bathroom with shower plus separate washroom with sink and junior tub. 3 closets. Picture window. Exclusive Family Harbor amenities: Access to Family Harbor Lounge featuring breakfast, snacks during the day, concierge service… plus Hasbro board games, family movies, video games and more. Kids eat free in most specialty onboard restaurants and get a free evening of Night Owls babysitting service. Two twin beds (convert to king). Sofa and coffee table. Desk and seat. Full bathroom with shower plus separate washroom with sink and junior tub. 3 closets. Picture window. Two twin beds (convert to king). Sofa and coffee table. Desk and seat. Full bathroom with shower. 3 closets. Floor-to-ceiling window. Outdoor patio facing Lanai with patio chairs, table and hammock chair. Exclusive Havana amenities: Exclusive daytime access to Havana Pool area. Reserved deck chairs on the Lanai. Note: All Havana stateroom guests must be 12 or older. Two twin beds (convert to king) and single sofa bed. Sofa and coffee table. Desk and seat. Full bathroom with shower. 3 closets. Picture window. Connecting door to adjacent stateroom. Two twin beds (convert to king). Sofa and coffee table. Desk and seat. Full bathroom with shower/whirlpool tub/bidet/double sinks. Walk-in dressing area with vanity table, seat and ample closet space. Private large balcony with patio chairs and table. Two twin beds (convert to king). Sofa and coffee table. Desk and seat. Full bathroom with shower/whirlpool tub/double sinks. Walk-in dressing area with ample closet space. Private standard-size balcony with obstructed view; patio chairs and table. Note: View is obstructed by steel balcony railing. Standard-size balcony is smaller than those on other suites. Exclusive Cloud 9 Spa amenities: Exclusive entry access to the adjacent Cloud 9 Spa facilities, upgraded in-stateroom amenities and Cloud 9 Spa Package exclusive to guests booked in Spa Accommodations. Only 1st and 2nd guests booked in Spa staterooms will receive the access and amenities; 3rd and 4th guests are not entitled to spa access and amenities. Two twin beds (convert to king) and single sofa bed. Sofa and coffee table. Desk and seat. Full bathroom with shower/whirlpool tub/double sinks. Walk-in dressing area with ample closet space. Private large balcony with patio chairs and table. Two twin beds (convert to king) and single sofa bed. Sofa, armchair and coffee table. Desk and seat. Full bathroom with shower/whirlpool tub/double sinks. 2 large closets. Walk-in dressing area with ample closet space. Private standard-size balcony with obstructed view; patio chairs and table. Note: View is obstructed by steel partition. Standard-size balcony is smaller than those on other suites. Two twin beds (convert to king), double sofa bed and one upper pullman. Sofa and coffee table. Desk and seat. Full bathroom with shower plus separate washroom with sink and junior tub. Walk-in dressing area with ample closet space. Private large balcony with patio chairs and table. Connecting door to adjacent stateroom. Exclusive Family Harbor amenities: Access to Family Harbor Lounge featuring breakfast, snacks during the day, concierge service… plus Hasbro board games, family movies, video games and more. Kids eat free in most specialty onboard restaurants and get a free evening of Night Owls babysitting service. Two twin beds (convert to king). Sofa and coffee table. Desk and seat. Full bathroom with rain shower. 3 closets. Floor-to-ceiling window. Outdoor patio facing Lanai with patio chairs, table and hammock chair. Exclusive Havana amenities: Exclusive daytime access to Havana Pool area. Reserved deck chairs on the Lanai. Note: All Havana stateroom guests must be 12 or older.